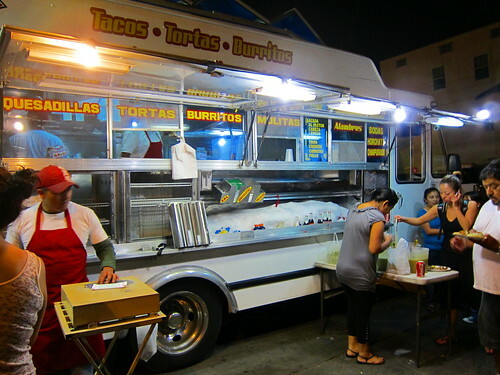 I’d love to take credit for finding this gem of a taco truck but the truth is my inbox has been lighting up for months about the superb tacos al pastor carved to order at the corner of Pico and Westmoreland. Like most great taco trucks Tacos Tamix is parked on the lot of a Car Wash. And like all great taco trucks, if it’s Friday night there’s going to be a crowd. A plate of tacos and a Mexican coke just has that extra bite on a Friday night. 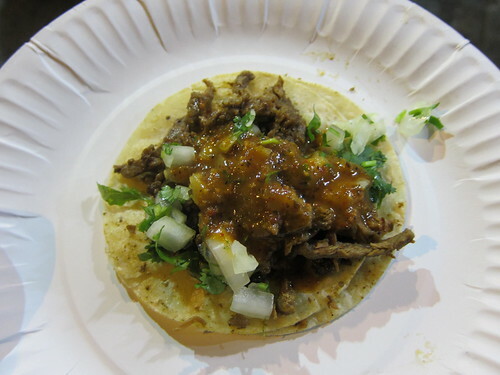 It’s hard to compare Tacos Tamix and Tacos Leo without eating both on the same night. Both make superior al pastor that is better than anything you will find in LA. 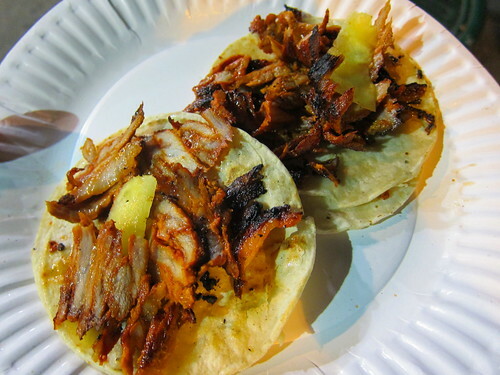 Both have skilled taqueros that carve the pork directly on to the tortilla and then flip a snippet of pineapple from the spit on to each taco. This skill alone was non-existent in LA up until the arrival of both these trucks. The standard for great al pastor has been set by these great taqueros. At a lot of taquerias and taco trucks what passes for al pastor is pretty sad. Ground pork doctored up with achiote is not al pastor; neither is shredded pork. Al Pastor cut from the spit is the minimal set up you should look for. When it’s carved from the spit then griddled on the plancha it loses something but I’ve still had great tacos this way. But the al pastor cut from the spit directly on to the tortilla is a whole different experience. Tacos Leo’s disadvantage is their location. At La Brea and Venice they are out in the open and are prime pickings for the city’s anti-taco patrol. Because of this Tacos Leo only pulls out the spit on Fridays and weekends. 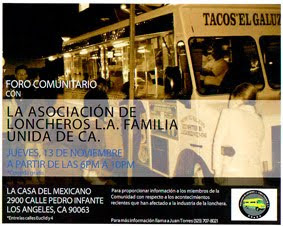 Tacos Tamix on the other hand is in the more taco friendly area of Pico-Union. When the police pull up to the truck it’s to order a plate of tacos, not shut them down. You order from a man behind a cashbox and all al pastor orders go to the taquero handling the al pastor with the other orders going inside the truck. If you order different meats chances are they will be ready at different times. This actually turns out pretty well as every taco has a maximum freshness. After getting my carne asada taco I took it to the table of salsas to garnish. They had a salsa roja, and verde with onions, cilantro and a pico de gallo. The salsa roja was excellent; a peppery blend of chile that was both spicy and flavorful. The asada taco was excellent; the greasy and finely chopped beef paired perfectly with the onion and chile salsa. I embarrassingly got a case of the hiccups after the first bite, which happens sometimes with spicy food. With al pastor this good I could almost eat it bare but the salsa roja was something special I didn’t want to miss out on. The pork had it all; charred bits at the edges, tender perfectly seasoned meat and the aftertaste of sweet pineapple mixed with the spicy pepper taste of the chile. 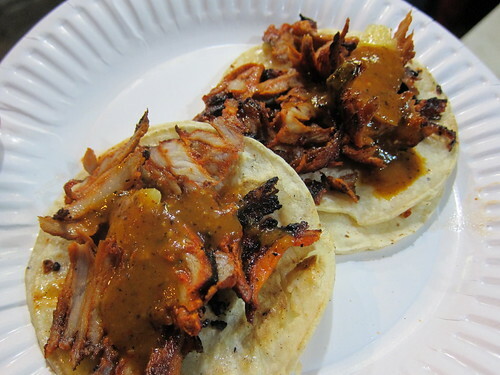 Does Tacos Tamix have the best al pastor in LA? Or is it Tacos Leo? I don’t know. More research (eating) is needed. I'm sorry to not be anywhere near the West Coast while reading this. Thanks to whomever(s) sent you the tip! My eyeballs grew very wide after I scrolled down to that first photo of the tacos! I'm looking forward to a visit. both tacos tamix and leos were great spots that had pastor on the the spit regularly for at least the two years i knew about them, a day after you reported on leo's they lost the spit and now they rarely have it, coincidence? it was there for a year no problems till that week. Now I'm sure the same will be true fro tamix. Its great you gave them business but it also seems like that ends up killing the spit. drove by taco tamix last night & there was no spit in sight!! luckily taco mexicali & co on 1st & beaudry was there for sum vampiros & cachetadas..u need to hit them up asap bandini!! i blogged about Leo's back in July and they got busted by the city in September. So what you said is not true. Leo's likely caught the attention of the city because they were setting up too early (often when it was still daylight). you could be right, I dont know if i saw your post the day you posted it or not, but when i DID see the post about Leos, that night the place was packed, next day new truck (the orange one thats there now) , no spit. I pass that one daily on my way home so it seemed to me like thats what happened. I've had them both on the same night a couple times and Tamix was better. Not that I Leos was bad at all, two of the best. I went to Tamix 2 times this week on weekdays at about 9pm and there was no spit. I'm going to return again and ask about it, but food bloggers may need to refrain from posting on places with pastor spits, as it seems they magically disappear once the spits go viral. the spit is probably just on Fridays and weekends. Nope, I went there on a Saturday night and no spit. Taco bloggers, please no more posting on trucks with pastor spits! You get them shut down! And if you do post on places with spits, don't show photos and use a code word like "special pastor". I'm not joking. did you ask about the trompo? Lets not jump to conclusions. We don't even know if the lack of trompo means the city shut it down. I'm going to go there tonight (friday). I will ask about the spit/trompo. The spit was up on Friday (12/10/10). Best pastor I have had in LA. Thanks for the tip Bandini. I suspect the disappearance of the trompos has less to to with the health department (otherwise, Zankou would be out of business) and more to do with unexpectedly high demand. These guys probably order a certain amount of meat per week and are simply unprepared when demand rises due to a good review on an influential site like Bandini's. got there at around 6 today (1/15/11) and the spit was set up. wonderful stuff! is it just me or does the flavor remind anyone of char siu? Perfectly tender and delicious, easily the best pastor i've had. did you really write a salsa bar etiquette essay? if so i would love a link to read it, i'm sure i have much to learn. Their Pastor really is fantastic. They ONLY do spit pastor FRI-SUN after 6:30pm. They might have added Thursdays, but I can't be sure. Why only those days? Everyone from the health department goes home by 6:30 on friday and are back on Monday. That gives Taco trucks all weekend to carve "improperly" handled meat without catching any heat. I've eaten here a bunch of times and the only stomach ache I got was one of sadness after I left because it's not closer to my house. 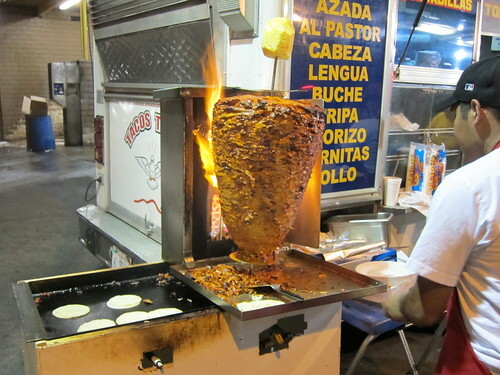 And really, show me a truck that offers Al Pastor of this quality for $1 a piece. It's practically impossible. I got FIVE tacos and a Mexican coke for $6.50. That's unheard of, especially in this town where food trucks have transcended to 10 dollar pieces of fried chicken and 20 dollar breakfast plates. If you don't like eating in seedy car wash parking lots on a maybe questionable neighborhood, then don't come. You're eating food from a truck, not from the Red O.
Tacos Leo(La Brea & Venice) is another place to get al pastor like this. I go back and forth deciding which is better. I like Tamix's salsas more. What happened to Tacos Tamix? I went last night and the sign on the truck had changed. Same truck I think but the food wasn't the same. The woman at the window said there had been un cambia but I didn't understand if it was a change of ownership or what. I need the Tamix fix and now I'll have to go to Leo.